Learning to eat to live, not live to eat. . . . . Check out the recipes, stories and quick links. . . .LOADS OF USEFUL INFORMATION! CLICK HERE TO SEE MY FIRST BLOG POST "WHY'D YOU DO IT, KEN?" Disqus now available after each post. Click on post title and go to the bottom of the page. Great for commenting.The links below will also take you to this post. Choose your favorite! Miss those Sunday Roast dinners? 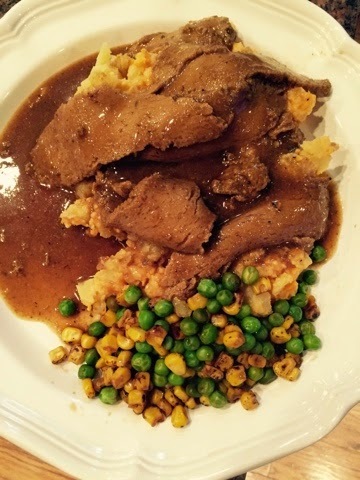 This is a delicious Roast Au Jus served over Yukon gold and sweet potato mash with roasted corn and fresh peas in a lemon soy sauce. Bring all ingredients to a slow boil then turn down to a simmer for 10 minutes. Let it rest until you're ready to use, then pour it through a fine mesh sieve. I know, I know! It's a mouthful of a title for the recipe, but this truly is wondrous in your mouth. People always complain that lasagna is a long, arduous process. This one would be if you made everything from scratch on the same day. However, if you put this at the back of your mind to make it after you've made my Best Bolognese Ever recipe ahead of time, (meaning you made plenty to have a lot of leftovers) this recipe will be a snap. It's only 4 ingredients if you have leftovers, oh, and some already made Ricotta Cheeze. Here's the recipe. Boil a large pot of water as if you were making the lasagna noodles (read the side of the box). I like to use the boil kind of noodles, but you can use the no-boil....it's a preference thing for me but maybe one less step for you. Set a large bowl of water with ice in it next to the boiling noodles. Put the spinach in the boiling water for 30 seconds and then lift it out and put it in the ice water. This will shock the spinach and set the color so you don't end up with black or dark colored spinach. Wrap the spinach in a kitchen towel and twist the two ends until you squeeze out as much water as possible. Put the Lasagna noodles in the already boiling water and boil according to the direction on the box (since we're rationing water in California this is a water saver tip). I used a 9" X 12" baking dish for the lasagna. 1. The first layer in any lasagna should always be sauce and this holds true here. 2. The noodles slightly overlapping each other. 5. Repeat steps 1-4 until you have three layers ending with a top layer of noodles with sauce. Tent some aluminum foil over the pan (keeping the aluminum from touching the lasagna) and bake for 30 minutes. Remove the aluminum and bake an additional 10 minutes. Let the lasagna rest because if you slice it now it will fall apart. Ideally, if this is a do-ahead meal, refrigerate, slice your pieces, and warm in a 325° for about 25 minutes. Sprinkle some Parmesan Sprinkle on top and enjoy. SEND ME YOUR COMPLIMENTS, CRITIQUES OR SUGGESTIONS HERE. IF YOU WANT TO READ FROM THE BEGINNING, CLICK HERE. THIS IS MY FIRST BLOG!